How to Start a Home Health Care Agency: What is Medicare? How to Start a Home Health Care Agency: For those seeking to start their own home health care agency, education is a crucial factor in attaining a successful outcome. A well-trained staff not only contributes to a higher quality of patient care, but also contributes to the profitability of the agency and long-term success. Potential new agency founders should be knowledgeable in both the clinical aspects of the home health industry, as well as the financial side of it. Medicare is a vital component of the home health and hospice care delivery system. While most of our readers are very knowledgeable on the program, we would like to share some information for those who are less familiar with its inner workings, or simply would like to know more. Recently, the Kaiser Family Foundation published an in-depth look at the program and what we might expect to see in the future- valuable knowledge for those already working in the home health industry or for those who are interested in potentially starting their own business. Medicare is the federal health insurance program created in 1965 for all people ages 65 and older, regardless of income or medical history, and expanded in 1972 to cover people under age 65 with permanent disabilities. Now covering 54 million Americans, Medicare plays a vital role in providing financial security to older people and those with disabilities. Medicare spending accounted for 14% of total federal spending in 2013 and 20% of national personal health spending in 2012. Most people ages 65 and older are entitled to Medicare Part A if they or their spouse are eligible for Social Security payments and have made payroll tax contributions for 10 or more years. Nonelderly people who receive Social Security Disability Insurance (SSDI) payments generally become eligible for Medicare after a two-year waiting period, while those diagnosed with end-stage renal disease (ESRD) and amyotrophic lateral sclerosis (ALS) become eligible for Medicare with no waiting period. Medicare has undergone numerous changes since its inception. Most recently, the Affordable Care Act of 2010 (ACA) contained a number of provisions affecting Medicare, including benefit improvements, spending reductions affecting providers and Medicare Advantage plans, delivery system reforms, premium increases for higher-income beneficiaries, and a payroll tax on earnings for higher-income people. These changes are being phased in over time. Medicare covers a diverse population (Exhibit 1). In 2013, half of all people on Medicare had incomes below $23,500 per person. In 2010 (the most recent year of data available), more than one quarter of all beneficiaries reported being in fair or poor health, and three in ten had a cognitive or mental impairment. Nearly 9 million beneficiaries (16%) are nonelderly people with disabilities and a growing share (13% in 2010) are age 85 or older. Two million beneficiaries (5%) lived in a long-term care facility in 2010. Part A covers inpatient hospital stays, skilled nursing facility stays, some home health visits, and hospice care. Part A benefits are subject to a deductible ($1,216 per benefit period in 2014) and coinsurance. Part B covers physician visits, outpatient services, preventive services, and some home health visits.. Part B benefits are subject to a deductible ($147 in 2014), and cost sharing generally applies for most Part B benefits. Part C refers to the Medicare Advantage program through which beneficiaries can enroll in a private health plan, such as a health maintenance organization (HMO) or preferred provider organization (PPO), and receive all Medicare-covered Part A and Part B benefits and typically Part D benefits. 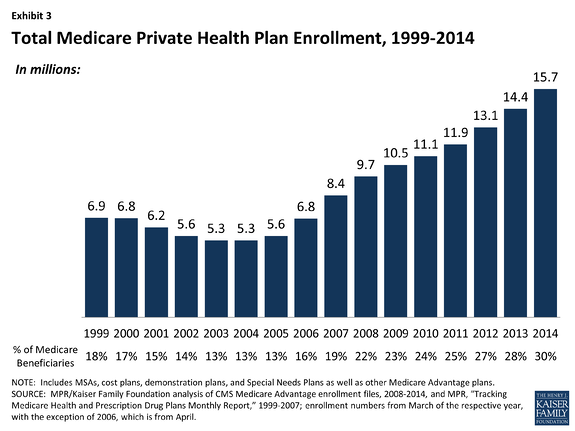 Enrollment in Medicare Advantage plans has grown over time, with nearly 16 million beneficiaries in a Medicare Advantage plan in 2014 (30% of all beneficiaries) (Exhibit 3). Part D covers outpatient prescription drugs through private plans that contract with Medicare, including both stand-alone prescription drug plans (PDPs) and Medicare Advantage drug plans (MA-PD plans); enrollment is voluntary. Enrollees pay monthly premiums and cost sharing for prescriptions (varying by plan), with additional financial assistance provided to beneficiaries with low incomes and modest assets. 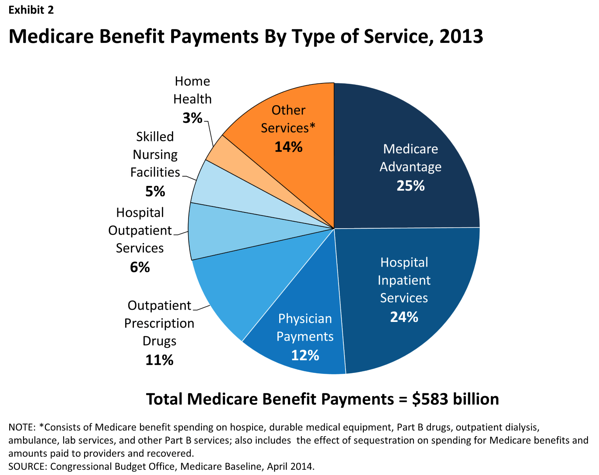 About 37 million receive Part D coverage under a PDP or Medicare Advantage drug plan in 2014. Medicare provides protection against the costs of many health care services, but traditional Medicare has relatively high deductibles and cost-sharing requirements and places no limit on beneficiaries’ out-of-pocket spending. Moreover, Medicare does not pay for some services vital to older people and those with disabilities, including long-term services and supports, dental services, eyeglasses, or hearing aids. Beneficiaries enrolled in Part D plans also may be subject to higher drug costs in the drug benefit’s coverage gap (also called the “doughnut hole”); in 2014, beneficiaries with prescription drug spending exceeding $2,850 are responsible for 47.5% of the cost for covered brand-name drugs and 72% of the cost of generics until they reach the catastrophic coverage limit ($4,550 in out-of-pocket costs in 2014). However, the coverage gap is gradually closing by 2020, when beneficiaries will pay no more than 25% of the cost of their drugs in the coverage gap. Employer-sponsored retiree health plans are a primary source of supplemental coverage for people on Medicare today; over time, however, fewer seniors are expected to have this type of coverage, since the share of employers offering it to their employees has dropped from 66% in 1988 to 28% in 2013. Medicare supplemental policies known as Medigap are another important source of supplemental coverage for people on Medicare. These policies fully or partially cover Medicare Part A and Part B cost-sharing requirements, including deductibles, copayments, and coinsurance. Premiums for Medigap can be costly, however, averaging $183 per month in 2010. Medicaid helps pay for Medicare’s premiums and cost sharing for Medicare beneficiaries with low incomes and modest assets (known as “dual eligibles”). Most of these beneficiaries also qualify for full Medicaid benefits, which include long-term care. While most beneficiaries have some type of supplemental coverage, 18% of Medicare beneficiaries with traditional Medicare had no supplemental coverage in 2010, including a disproportionate share of beneficiaries under age 65 with disabilities, the near poor (those with incomes between $10,000 and $20,000), rural residents, and black beneficiaries. 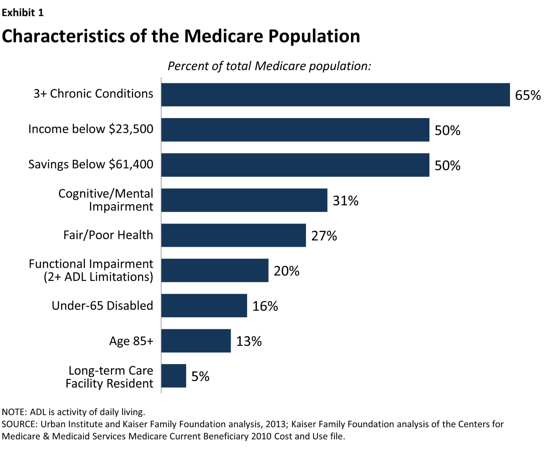 Medicare spending is affected by a number of factors, including the number of beneficiaries, how care is delivered, the use of services, and health care prices. 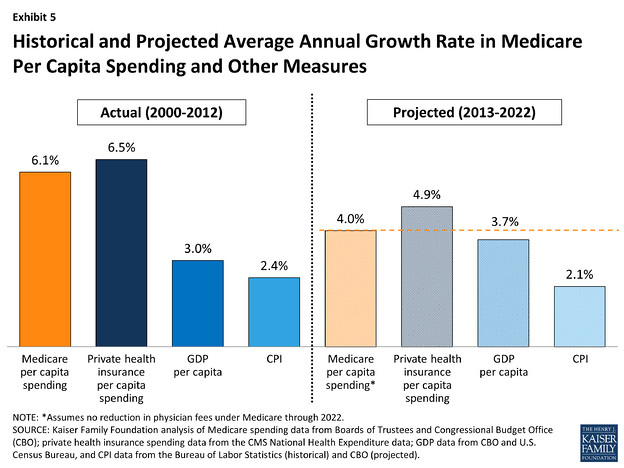 Both in the aggregate and on a per capita basis, Medicare spending growth has slowed in recent years and is expected to grow at a slower rate in the future than in the past—and even slower than was projected just a few years ago. Based on a comparison of CBO’s August 2010 and April 2014 baselines, Medicare spending in 2014 will be about $1,000 lower per person than was expected in 2010, soon after passage of the ACA. Looking ahead, Medicare spending (net of income from premiums and other offsetting receipts) is projected to grow from $512 billion in 2014 to $858 billion in 2024. These estimates do not take into account additional spending that is likely to occur to avoid reductions in physician fees scheduled under current law. On a per person basis, Medicare spending is projected to grow at 4.0% annually between 2013 and 2022 (factoring in the projected cost of physician payment updates). This growth rate is projected to be slower than private health insurance spending on a per person basis over the same time period, and somewhat faster than growth in the economy, as measured by GDP per capita (Exhibit 5). The Affordable Care Act directed the Centers for Medicare and Medicaid Services (CMS) to test and implement new approaches for Medicare to pay doctors, hospitals, and other providers and to bring about changes in how providers organize and deliver care. These new approaches typically include financial incentives that are designed to encourage collaboration and care coordination among different providers (such as hospitals and doctors), reduce spending on unnecessary services, and reward providers for providing higher quality patient care. Accountable Care Organizations (ACOs) are one example of a delivery system reform model currently being tested within Medicare. The ACO model allows groups of providers to accept responsibility for the overall care of Medicare beneficiaries and share in financial savings if spending and care quality targets are met. Other new models being tested include various payment approaches for so-called “medical homes” and initiatives aimed to reduce hospital readmissions. These models are being evaluated to determine their effect on Medicare spending and the quality of care provided to beneficiaries. Medicare faces a number of critical issues and challenges, perhaps none greater than providing affordable, quality care to an aging population while keeping the program financially secure for future generations. The ACA included numerous changes designed to improve Medicare benefits, slow the growth in Medicare spending, and improve the quality and delivery of care. Further changes to Medicare could be considered as part of broader efforts to reduce the federal debt and to curtail reductions in Medicare’s physician fee schedule which are called for in the coming years. And yet, in recent years Medicare spending has grown at a much slower rate compared to historical spending growth, which may ease the pressure for significant changes to the program in the near term and give policymakers an opportunity for thoughtful consideration of ways to bolster the program for an aging population over the longer term. As policymakers consider possible changes to Medicare, it will be important to monitor not only the effect of these changes on total health care expenditures, including Medicare spending, but also the impact on beneficiaries’ access to quality care and their out-of-pocket costs.